Beginning in early 2014 I organised a short series of talks at the Max Delbrück Center for Molecular Medicine (MDC). It was a no-budget grassroots action, on behalf of a small group of open science enthusiasts from the campus. Our target audience was researchers from the campus and further afield, hoping to spark a wider discussion on issues around open science and ultimately inspire a process of change at our institutions. Several of us behind the project had been very inspired by the Berlin 11 Satellite Conference for Students and Early Career Researchers organised by Nick Shockley of the Right to Research Coalition held in November 2013 in Berlin, which later grew to become OpenCon. The talks series, Scientific Publishing: How to fix a broken system, highlights the challenges facing the traditional model of scientific publishing, the changes already being brought into play, and potential future directions – everything you need to know about a publishing industry in transition. We hope to bring you speakers on the latest topics and debates around open access, open science, impact factors and more. Do we have to waste so much time with our publications? 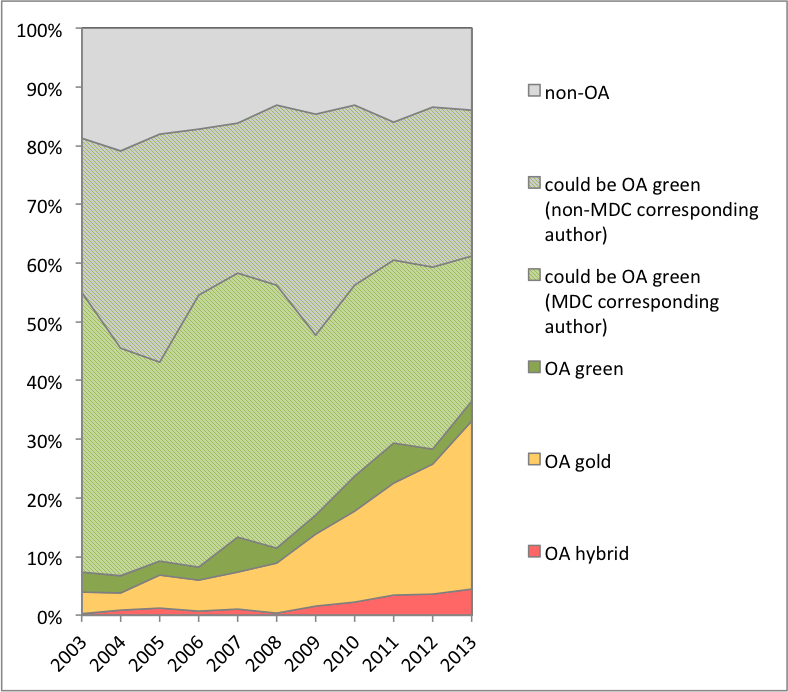 It shows how, despite regular request emails from the MDC library to authors of papers eligible for ‘green route’ open access / self-archiving in the repository (since 2010), the manuscript submission rate was very poor. It became clear that there was a lot of confusion about the different approaches to open access and often a real lack of awareness. Only those PIs with EU funding were very familiar with the issues thanks to the mandates for open access associated with those funding streams. The talk itself led to an immediate uptick in submissions to the repository, which was gratifying. But to encourage a sustainable change in behaviour a project was started to develop and improve information about the options for open access publishing from the library via their webpages and email communications, as well as raising questions about the interoperability of the MDC repository. An MDC open science representative was subsequently appointed, but I remained involved as an unofficial advisor and advocate (Article, “An open access strategy for Berlin“) and continue to be active in the grassroots open science movement.